It has been said that a volunteer is a person who remembers to do the things that makes others happy, a person who takes the loneliness out of those who are lonely, a person who is concerned when others are unconcerned. The Erlanger Auxiliary started the volunteer tradition in 1934 after Mrs. Richard Kimball visited the hospital and found nurses washing linens in tin tubs. She immediately started asking churches and civic groups for help recruiting volunteers and donating dollars to fund much needed equipment and supplies to Erlanger. Some of the Auxiliary’s earliest contributions were to run errands for patients, mend worn linens and write letters, but they soon extended their effort to raising funds for new equipment and supplies. In 1950, the Auxiliary purchased a station wagon to help transport nurses to the hospital as well as T.C. Thompson Children’s Hospital patients to Erlanger for therapy. They also began a new service of taking pictures of newborns, a service the Auxiliary still manages today. 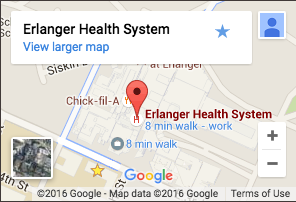 Today, the Auxiliary continues as the only volunteer group dedicated solely to Erlanger. Each year more than 800 volunteers, including 200 summer VounTEENS as well as American Red Cross volunteers and Foster Grandparents, transport patients by wheelchair, assist family members with directions, cuddle babies in the NICU, visit patients in their rooms, run the Erlanger Gift Shop and so much more. More than 100,000 hours of valuable time and talents are shared with the health system and the community. Many of Erlanger's volunteers are college students getting their first look and experience in their future careers at the region's only teaching hospital and children's hospital. The Auxiliary is also committed to furthering Erlanger's mission financially. Volunteers work to raise money through the Auxiliary Gift Shop, a uniform store, newborn baby photos and special sales. In 2013, the Auxiliary donated and/or pledged more than $300,000 to Erlanger for much-needed equipment, supplies and services. Would you like to be a part of this strong and caring adult volunteer group? Please take a look at the many wonderful volunteer opportunities as well as the requirements listed below and apply online. Erlanger’s Service Learning College Volunteer Program gives college students experience in our real-life classrooms here at Erlanger Health System. With volunteer opportunities available in both clinical and non-clinical areas, students of many fields of study, including nursing, pre-med, allied health, business administration and accounting, will learn valuable skills and insights by learning about the many rewarding healthcare careers. Along with the requirements listed below, participants must commit to volunteering at least four hours once a week for at least two consecutive semesters. If you are currently enrolled in college and would like to participate in this program, please read about the various volunteer opportunities and apply online. Applicants will be interviewed by the Volunteer Services staff and by the department(s) to which they apply. Reference checks, backgrounds checks, TB skin tests and proof of immunizations are all required before becoming a volunteer. Adult volunteers not enrolled in college must commit to giving at least four hours of their time at least once a week for a minimum of six months. College student volunteers must commit to giving at least four hours of their time at least once a week for a minimum of two consecutive semesters. Senior volunteers will receive reserved parking on the Baroness Campus. Every summer at Erlanger, around 150 local high school students between the ages of 15 and 18 serve their community in a safe and educational environment. Both clinical and non-clinical areas are open to the VolunTEENS, giving them a chance to help others, to see what a hospital is all about, and, for many, to confirm their aspirations to pursue a career in medicine. The program currently runs from June through July and is highly competitive. Adult volunteers will be interviewed by the Volunteer Services Manager and the department(s) to which they apply and will also be required to have a flu shot, TB skin test, reference and background check, and HIPAA training, which are all provided by Erlanger Volunteer Services. Volunteers must also purchase the volunteer uniform shirt at $20. (If this cost is prohibitive, please let us know.) Each day of work, volunteers will receive free parking and a meal credit at Erlanger's Cross Roads Cafe.